The HOLI ONE Colour festival will be taking place on 2nd August from noon until 10pm and aims to unite people through music and colour. Thousands of people are expected to attend to share music, dance, performance art and visual stimulation. Against a backdrop of dance and DJ music, revellers get to throw powders into the air to create an explosion of colour and excitement aimed at celebrating togetherness and the colour of everyday life. 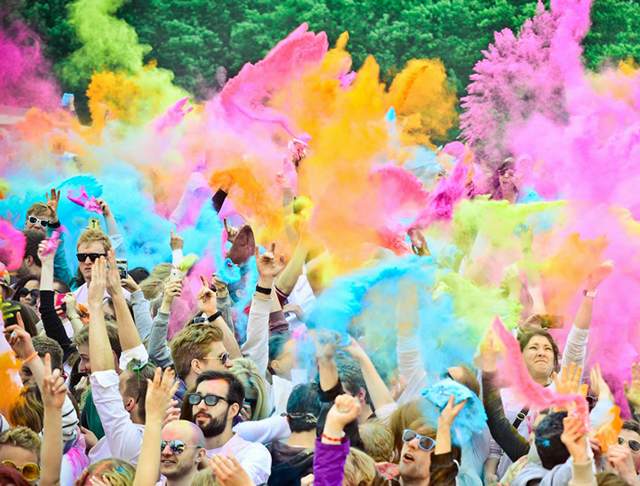 Stephan Dau, founder of HOLI ONE Colour Festivals, said: “We’re excited to bring the HOLI ONE experience to Manchester this summer. Heaton Park is a fantastic location and we’re sure everybody who attends will have a great time. We’re currently in the planning phase, working with local businesses and DJs to ensure the event is as enjoyable and memorable as possible and we’d encourage local talent to get in touch if they’d be interested in performing on the day. The festival is all about making friends, coming together and having an unforgettable experience. Everyone is equal at HOLI ONE and everyone leaves looking the same, covered in safe and quality cosmetic powder, with a smile on their face and some great pictures to remember it all by. Last year, HOLI ONE Colour festivals were attended by 100,000 people worldwide and took place across cities and countries that included London, South Africa and Berlin.